New York, NY — Donald Tisdel, a longtime member of the U.S. Tennis Association (USTA) board of directors, has been named “Person of the Year” for 2016 by Tennis Industry magazine in the publication’s January 2017 issue. 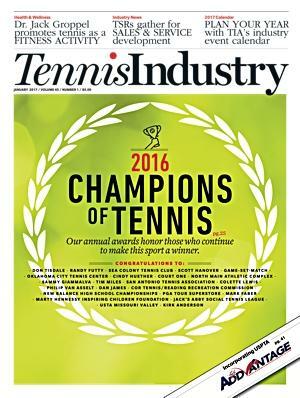 Tisdel led off the magazine’s 16th annual “Champions of Tennis Awards,” which honors people, businesses and organizations dedicated to improving the sport and business of tennis. Tisdel, who recently moved from Lake Oswego, Ore., to Seattle, Wash., has been a USTA board member since 2005, most recently serving as a vice president. But it’s his financial expertise and knowledge that has been so valuable to the tennis industry — Tisdel has been instrumental in supporting major projects such as the renovation and reconstruction at the USTA Billie Jean King National Tennis Center in New York (home of the US Open) and the construction of the 100-court USTA National Campus in Orlando, Fla.
Tennis Industry Service Award: Randy Futty, Crozet, Va. Private Facility of the Year: Sea Colony Tennis Club, Bethany Beach, Del. Grassroots Tennis Champion of the Year: Scott Hanover, Kansas City, Mo. Pro/Specialty Retailer of the Year: Game-Set-Match, Denver, Colo.
Municipal Tennis Facility of the Year: Oklahoma City Tennis Center, Oklahoma City, Okla.
Tennis Advocate of the Year: Cindy Huether, Sioux Falls, S.D. Builder/Contractor of the Year: Court One, Raleigh, N.C.
Public Park of the Year: North Main Athletic Complex, Holly Springs, N.C. Wheelchair Tennis Champion of the Year: Dan James, Seattle, Wash. Junior Tennis Champion of the Year: Colette Lewis, Kalamazoo, Mich.
Stringer of the Year: Philip van Asselt, Bryn Mawr, Pa.
Park & Rec Agency of the Year: COR Tennis/Reading Recreation Commission, Reading, Pa.
National Junior Tennis & Learning (NJTL) Organization of the Year: Marty Hennessy Inspiring Children Foundation, Las Vegas, Nev.
Professional Tennis Registry (PTR) Member of the Year: Kirk Anderson, Tigard, Ore.
U.S. Professional Tennis Association (USPTA) Member of the Year: Kirk Anderson, Tigard, Ore.
Tennis Industry has been covering the tennis business and the sport for 45 years. Available in both print and digital editions, TI is the official publication of the Tennis Industry Association, U.S. Racquet Stringers Association, and American Sports Builders Association. Visit tennisindustrymag.com.